In another exclusive, Rewarding Times has teamed up with the Glasshouse Hotel in Sligo to offer you a , 2 Night Midweek Stay for two people, with afternoon tea for two on one day. 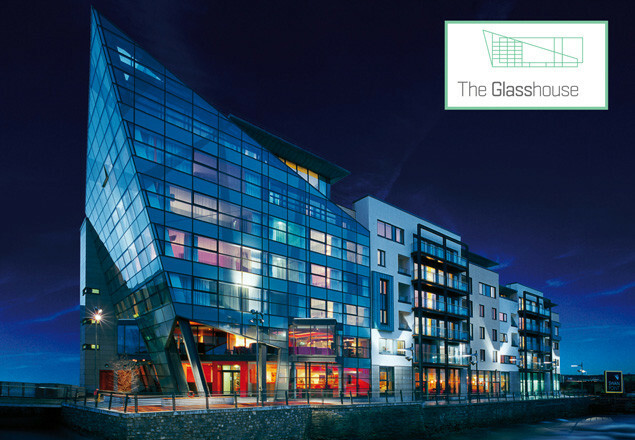 The Glasshouse is Sligo's only 4 Star City Centre hotel, located right in the heart of Sligo it sits like a glittering glass beacon on the banks of the Garavogue river. The hotel interiors are as dramatic as the exterior with bold colours combined in quirky combinations. Enjoy overnight bed and breakfast in one of the hotels 116 luxurious bedrooms. If you are a food lover, The Glasshouse is the place to be, voted Best Hotel Restaurant at the recent Irish Hotel Awards, The Kitchen Restaurant offers superb cuisine with great river views. Enjoy afternoon tea in the View Bar, sit back and enjoy the great views of Sligo and our fanastic range of afternoon tea treats ! Sligo has a great range of shops, galleries and cafes to enjoy, all close to the hotel. Further afield there are great beaches, seaweed baths, championship golf and lots more. Vouchers are valid from October 1st until 29th March 2018.